Toys! Souvenirs! Home needs! What? 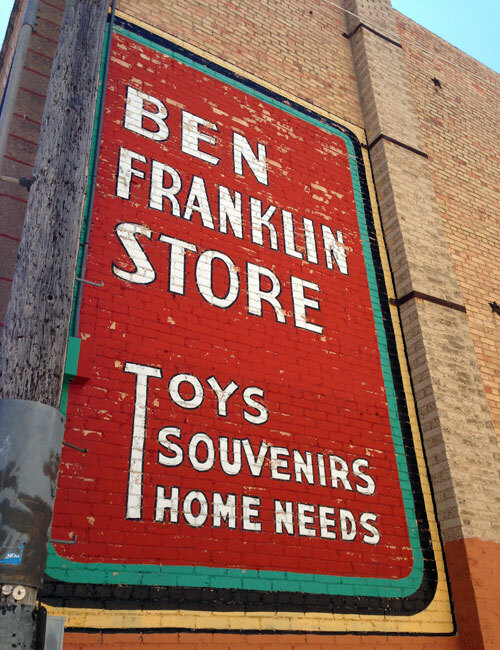 This ghost sign for the Ben Franklin Store is located on 7th St. in Rapid City, SD between St. Joseph and Main Sts. Beautiful. 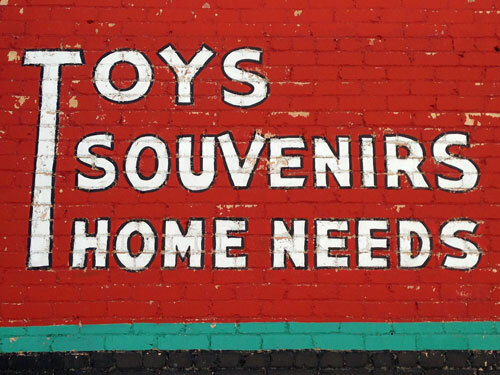 The Ben Franklin store, where I grew up, had an amazing toy selection. No ghost sign, but still an amazing memory this brings up. So, this was a chain? A regional one? Can you tell me a bit about the “home needs” category? Rapid City seems like a pretty cool town. This sign is more or less across the street from Art Alley, which is a legal place for street art. I even saw posters advertising a graffiti symposium or some such. I was a bit surprised! Ben Franklin was kind of like an updated Woolworth’s. The one we had in North Platte had a little of everything, but was also heavy on the arts and crafts. I remember a large section for wool and fabrics. I’ve been to Rapid City, but as a kid. We went to Reptile Gardens once, and that was about it. But, the name always gave me the impression there was a lot more going on there. Aaaaand, looking at Google Maps, and Yelp, it appears the NP Ben Franklin is still open. Not to beat a dead horse, but there is one in Bethel, if you’re really curious. Hey, your store is still open! I remember Woolworth’s, back when the term “five and dime” still meant that you could buy something [like one piece of candy] for a nickel or two. The name Rapid City definitely suggests an aerodynamic, performance-oriented, happenin’ place, like the city equivalent of Arte Moderne architecture or industrial design. I’m not sure it’s all that, but it’s definitely more than just a pit stop, which was what I’d expected.